Sri Lankan soldiers patrol the Jaffna peninsula on April 6, 2008. At least 52 guerrillas and 38 soldiers were killed and hundreds more wounded during an offensive on the northern Jaffna peninsula. At least 52 Tamil Tigers and 38 soldiers were killed and scores wounded in fierce fighting Wednesday between advancing Sri Lankan troops and the rebels in the northern Jaffna peninsula, the military said. Military spokesman Brigadier Udaya Nanayakkara said that heavy fighting broke out when the Liberation Tigers of Tamil Eelam (LTTE) “launched a pre-dawn attack on the military’s forward defences at Kilali and Muhamalai areas. “At least 52 LTTE cadres were killed during these clashes. The death toll of the soldiers has risen from 15 to 38,” he said, adding 84 soldiers were also wounded in one of the worst outbreaks of fighting this year. “Some of the wounded soldiers have been airlifted to Colombo for further treatment,” he said. “Our troops successfully retaliated the LTTE offensive and went forward about 500 metres into LTTE-held areas along the eight-kilometre Forward Defence Line from Muhamalai to Kilali,” Brig. Nanayakkara said. He said the Sri Lanka Army’s 55 and 53 divisions “are now consolidating their newly captured positions”. Meanwhile, the pro-LTTE Tamilnet website quoted rebel sources as saying that the military’s pre-dawn attempt to break into LTTE-held areas on the northern front had been “fully thwarted”. “Sri Lanka Army units that attempted to break the Forward Defence Line of the LTTE in Kilali, Muhamalai and on several other positions were forced to retreat, leaving behind dead bodies,” the report claimed. Claiming that the fighting lasted well over eight hours, it said that the Sri Lankan Army suffered heavy casualties as the Tigers put up stiff resistance. “Casualty details would be released after the ongoing clearing mission is completed,” the Tigers said. The escalation in violence between the advancing government troops and the LTTE in the Wanni, Jaffna and Mannar regions has left hundreds of combatants dead. Independent verification of the battlefront casualties are not possible because journalists are barred from visiting the area. Fighting has escalated in Sri Lanka since December 2005. The military captured the whole of the eastern province from the LTTE last year and it is now trying to seize rebel territory in the north. At least 52 guerrillas and 38 soldiers were killed and hundreds more wounded Wednesday, officials said, as Tamil separatists reported repulsing a Sri Lankan offensive ahead of key local elections. The defence ministry said 84 soldiers were also wounded in the latest bid to take territory from the Liberation Tigers of Tamil Eelam (LTTE) on the northern Jaffna peninsula. However, a military source told AFP that the security force casualties were 40 dead and 375 wounded, while several more were missing. It was the military’s heaviest losses in a single battle since October 2006. “Monitored radio communications and ground sources have confirmed that 52 LTTE terrorists have been killed and many injured in the latest skirmishes in Jaffna,” the defence ministry said. The Tigers did not give details of their casualties, but pro-rebel websites reported that they inflicted heavy losses on the security forces. “The Sri Lankan army advanced on two fronts and the LTTE successfully thwarted their attack after 10-and-a-half hours of stiff resistance,” said the Tamil language Puthinam.com. He said initially resistance was limited and the LTTE’s first line of defence was captured, but the guerrillas then brought down artillery fire forcing a retreat. Security forces have been trying to dismantle a de facto rebel mini-state in the north of the island after successfully driving the guerrillas out of the adjoining Eastern province in July last year. The government is staging crucial provincial council polls in the east on May 10 and has been banking on further military success against the Tigers to boost their electoral fortunes. Defence sources said Wednesday’s setback was a repeat of the October 2006 debacle when the security forces were pushed back by a major counter offensive of the Tigers, with 129 government soldiers killed and 515 wounded. The latest setback came despite official claims that the separatists had been virtually wiped out. At the start of the year, the military said there were only 3,000 Tiger rebels left. Official defence ministry figures show that 3,025 Tigers have been killed by security forces this year already. During the same period, the military has lost 218 soldiers, according to the defence ministry. Military analysts noted that security forces had underestimated the strength of the Tigers, who had concentrated their forces in their mini-state in the north after they were driven out from the multi-ethnic eastern province. Troops have been using aircraft, helicopter gunships and multi-barrel rockets against the Tigers while the rebels deploy mainly artillery and mortars at the battle front. However, the guerrillas have also occasionally used light aircraft to bomb military installations besides sending in suicide bombers. The Tigers ran the Jaffna peninsula as a de facto separate state for five years till October 1995 when they were driven out. However, they took back the southern part of the peninsula in April 2000. The LTTE have been fighting since 1972 to carve out an independent homeland for minority Tamils in the north and east. Tens of thousands have died on both sides. Both the Liberation Tigers of Tamil Eelam (LTTE) and the Sri Lanka Army (SLA) have suffered heavy casualties in the fighting that raged along Muhamalai and Kilali defence lines since yesterday (23rd) dawn. Nearly 120 SLA soldiers have either been killed or gone missing in the operation that lasted for 10 hours. 370 soldiers are reported to be wounded. Around 250 of the wounded are in P1 (Seriously wounded) and P2 (Less seriously wounded) categories. In addition to these casualties, 4 main battle tanks (excluding the T-55 that was lost on the 22nd) of the army have also sustained damage. LTTE casualties stand at 52 killed and an unknown number injured. SLA soldiers who valiantly battled it out on a terrain which the enemy had the advantage, even managed to storm the first LTTE defence line on two fronts. The LTTE, employing a similar tactic it used back in 2006, withdrew to secondary lines and brought a large volume of artillery fire on the troops consolidating newly captured positions. It was this rain of artillery shells that caused most of SLA casualties. The Sri Lanka Army’s advance towards Kilali and Muhamalai LTTE FDL (originally 2nd FDL) managed in the capture of the LTTE’s 1st FDL but were surprised by a heavy volume of artillery and mortar attacks launched by Tigers from LTTE areas. The Tigers, sensing the advance retreated and direct artillery strikes at advancing troops killing 88 soldiers while 30 others have gone missing. 376 soldiers were wounded in action. The number of Tigers killed is 52 while LTTE claims it lost only 16 fighters. The Tigers have also claimed the SLA lost 150 soldiers, which is not true. Meanwhile the main Battle Tank (MBT) lost in yesterday’s fighting is now believed to be an Armoured Personnel Carrier (APC) T89 (or YW534). This is a China North Industries APC made similar in shape (tracked) to an MBT but with a smaller canon for an entirely different battlefield concept. Yesterday’s battle needs to be corrected in the following way…. Troops from 55 Division advancing from Muhamalai and Kilali captured the LTTE’s Forward Defence Line and recovered 17 dead bodies of Tigers. The LTTE was in total disarray in this front. However, in the next front at Nagarkovil, troops from the 53 Division who attempted to charge the LTTE FDL was beaten back heavily in open terrain by long range artillery and mortar fire. Troops who managed to enter the LTTE trenches were killed in booby traps planted by the Tigers. Although the 55 Division had captured the Tiger FDL, the 53 Division’s bungling made it impossible to link the line and troops withdrew after several hours with the dead bodies of Tigers, some of which was handed over to Jaffna police yesterday to be given to ICRC. The 53 Division, comprising only regular infantry (533/534) also includes the Mechanized Infantry and Air Mobile Brigades. Some sources have claimed 53 Div comprises of Commandos and Special Forces. This is not true. These two specialized Regiments comes under the Army Commander’s Reserve since a few years back. The defeat at Nagarkovil yesterday is the 3rd comprehensive defeat in Jaffna in recent times. Two of the three operations were led by Brigadier Samantha Sooriyabandara. Despite yesterday’s loss and another loss many months ago where two Main Battle Tanks were lost due to poor leadership, Brigadier Sooriyabandara is to be appointed Defence Attache to the Sri Lanka Embassy in the United States, highly placed sources told. Due to various propaganda estimates, guesstimates and copycat figures we would like to clear the casualty figure in the Army in the confrontation on the 23rd. Some sources had made false claims that 143 bodies of soldiers were lying in 3 funeral parlors in Colombo. Others claimed figures were close to Tamilnet, which is 34 men more than the actual figure. We do not wish to discuss the Army’s own figures for obvious reasons. According to reliable sources 88 soldiers were dead by last evening while 376 were injured and the remains of 28 more categorized as missing were handed over by ICRC in Vavuniya. This means a total of 116 were killed. Of the 376, 174 are P1 and P2 (seriously and somewhat seriously wounded) while 190 categorized as P3 or walking wounded. If some of the soldiers in P1 die fighting for their lives in hospital, the actual number could increase. However, this is NOT the case at this moment in time. The casualties to the LTTE is unknown. What is known for sure is that 17 dead Tiger bodies were recovered from Muhamalai and Kilali. The Sri Lanka Army Armoured Corp lost a T-55 Main Battle Tank (MBT) in fighting that erupted along the LTTE’s 2nd Forward Defence Line in Muhamalai around 9.30am today. Four men in the tank were also injured in the attack. The Army believes an RPG-7 HEAT was fired by the tigers from a nearby cover which caused damages to the tank. The tank is not in a repairable condition, according to highly placed sources. A T-55 Main Battle Tank (MBT) of the army was damaged beyond repair when it was hit by hostile fire near the LTTE forward defence line (FDL) today morning. The crew of four sustained injuries in the incident but were rescued by the army and are now being treated for their injuries.The LTTE is known to have deployed a considerable number of troops from its Victor anti armor brigade in fear of army’s newly raised Mechanized Infantry Brigade. The Sri Lankan army operates over 65 T-55 and T-55AM2 Main Battle tanks acquired largely from Czechoslovakia, along with other armored vehicles in their war against the LTTE. Over 100 LTTE including 15 senior terrorists and 43 soldiers were killed in fierce fighting that lasted for 11hours between SLA and LTTE in the narrow and open land stretches at Muhamalai and Kilaly – Jaffna yesterday (Apr 23), according to finalized reports received from North. Troops have also recovered 9 LTTE bodies left behind as Army pushed and gained control over the LTTE’s first line of defence at Muhamalai. Many LTTE bodies are scattered in the area and preparations are made to recover the bodies and hand those over to the LTTE through the ICRC, military sources said. “Soldiers have been able to capture the first line of bunkers of the Tigers in Muhamalai. LTTE terrorists came and attacked our forward line on Wednesday morning, we have retaliated and captured about 400 to 500 metres of LTTE area in Muhamalai,” said military spokesperson Brigadier Udaya Nanayakkara. “Canter vehicles loaded with dead LTTE cadres and casualties were rushing continuously towards Mullaittiuvu and Kilinochchi districts since yesterday morning as civilians were restricted of movement along the main routes for over 7 hours”, unverified sources close to LTTE were quoted as saying. LTTE civil militia units and ‘Police’ stormed into government hospitals at Kilinochchi and Mullaittiuvu; forcibly vacated the area of civilian presence allocating space for the arriving LTTE casualties. Accommodated patients were taken off from their beds and forced to lie on cardboard sheets, while women and children were cornered and others chased away from the sites, the sources were quoted further saying. Defence sources report that the LTTE offensive was overall led by Theepan and Muhundan, two senior LTTE cadres , whilst fighting formations at Muhamalai and Kilaly were reported respectively led by ‘Jerry’, Kumunan and Kutti. Tamil rebels killed at least 100 Sri Lankan soldiers in the nation’s bloodiest battle in 18 months on Wednesday, the separatists said, as the military claimed more than 100 rebels died in the fighting. The Tamil Tigers claimed they killed more than 100 government troops and had recovered 30 of the bodies, which will be returned to the families. The rebels said they lost 16 of their fighters. The defence ministry said its forces killed more than 100 Tigers and said it had lost 43 soldiers, with another 33 missing in action, following pre-dawn fighting in the northern peninsula of Jaffna. The military suffered its heaviest loss in a single offensive since October 2006. There was no independent verification of the conflicting tolls. But a Sri Lankan military source confirmed that troops mounted a two-pronged assault on the LTTE’s forward defence lines under the cover of darkness and were forced to retreat after encountering strong resistance. A picture released on a pro-rebel website showed what was said to be soldiers killed inside a Tiger bunker line. Security forces have been trying to dismantle a de facto rebel mini-state in the island’s north after successfully driving the guerrillas out of the neighbouring eastern province in July 2007. Defence sources said Wednesday’s setback was a repeat of the October 2006 debacle, when security forces were pushed back by a major Tiger counter-offensive, leaving 129 government soldiers slain and 515 wounded. At the start of the year, the military said there were only 3,000 Tiger rebels left. Latest official defence ministry figures, which include Wednesday’s toll, show that 3,073 Tigers have been killed by security forces this year. During the same period, the military has lost 223 soldiers, according to the defence ministry. Troops have been using aircraft, helicopter gunships and multi-barrel rockets against the Tigers, while the rebels deploy mostly artillery and mortars. However, the guerrillas have also occasionally used suicide bombers and light aircraft. The Tigers ran the Jaffna peninsula as a de facto separate state for five years until they were driven out in October 1995. However, they took back the southern part of the peninsula in April 2000. The LTTE have been fighting to carve out an independent homeland for minority Tamils since 1972. Tens of thousands have died on both sides in the conflict. At least 165 soldiers were killed and 20 more went missing in a major battle with Tamil separatists this week, military sources told on Friday as journalists complained of unofficial censorship. With reports of higher casualties emerging — making Wednesday’s clash the bloodiest in recent years — the authorities extended “unofficial” censorship to hospitals and funeral parlours where photographers and reporters were shut out, a media rights group said. The death toll from the sources were far higher than official defence ministry casualty figures, which gave 43 soldiers dead and 38 missing from Wednesday’s fighting in the northern peninsula of Jaffna. The Liberation Tigers of Tamil Eelam (LTTE) on Thursday returned via the international Red Cross the bodies of 28 soldiers they had captured. The government also reported killing more than 100 rebels and wounding 100 more in the pre-dawn offensive along the Muhamalai front lines on the peninsula. The Tigers said only 25 of its fighters were killed. Official defence ministry casualties reports and LTTE figures can seldom be verified because the government prevents journalists from visiting war zones and territory held by the rebels. The ministry claims 3,105 rebels have been killed already this year — more than intelligence estimates of the number of LTTE fighters, which was put at 3,000. Wednesday’s confrontation was by far the biggest battle since Colombo withdrew from a Norwegian-arranged truce in January. The Free Media Movement (FMM) said the authorities had prevented photographers taking pictures of military casualties moved to hospitals in the aftermath of the fighting. Soldiers also provided tight security at undertakers to block the media. 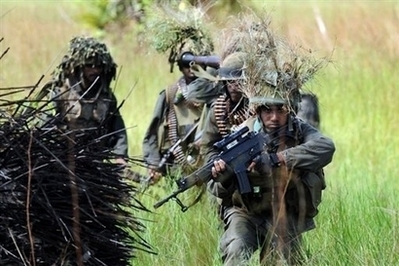 “It is highly likely that these measures have been taken after heavy losses faced by the Sri Lankan army earlier this week after fighting intensified in the north,” the FMM said in a statement. The group said it was urging the government as well as the LTTE to respect the right to information. It said only foreign wire services and a few news websites operating from Colombo reported battlefront casualties independent of government press releases. Despite the heavy losses in Jaffna, troops made a fresh push into rebel-held territory in the north and captured the Catholic pilgrim town of Madhu, where a venerated shrine is located, the military said Friday. “Soldiers of the Sri Lanka Light Infantry reached the shrine as the terrorists beat a retreat unable to withstand the army advance,” the defence ministry said in a statement. There was no immediate comment from the LTTE, but the rebels had accused the army of launching artillery attacks in the area. The church, in the coastal Mannar district, has in the past provided a sanctuary for thousands of civilians sheltering from crossfire, the ministry said. It accused the LTTE of turning the shrine into “a terror base by positioning its heavy guns around the church and using it as a barrack for its cadres” since they took control of the area in 1999. But there were no reports of casualties from Madhu. The LTTE have been fighting to carve out an independent homeland for Tamils since 1972. Tens of thousands have died on both sides in the conflict.